Thorny plants doesn't sound like the most appealing category, but it includes some of the most beloved species around homes and gardens. Plus, sometimes a thorny plant is exactly what is needed - they make hedges much more difficult for intruders to penetrate, for example. Numerous trees have thorns, some on their trunks, but usually only on their branches or leaves. People often think of hollies as shrubs, but that only applies to certain cultivars. The American holly that grows wild throughout the eastern U.S. can reach 50 feet or more and is commonly used as a specimen tree or a tall hedge in home landscapes. The thorns are on the leaves of these trees, making them very difficult to pass through when planted as a dense hedge. They are evergreen, known for their red berries in winter and are one of the few plants of this size that is fully shade tolerant. Hollies will tolerate full sun, however, but they do best in places with acidic soil. It is usually necessary to plant more than one in order to get fruit. Nellie Stevens is a fast-growing holly with a pyramidal growth habit. Argentea marginata is a variegated cultivar with silver margins on the leaves. 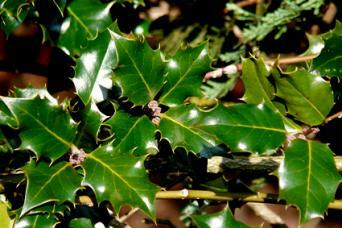 Croonenberg is a self-fertile holly, meaning it will make fruit without a second tree planted nearby. These shrubby trees reach from 12 to 50 feet in height, depending on the species, with thorns on the branches that can be several inches in length. To make up for their thorny character, however, hawthorn trees bear a profusion of white flowers in early spring, followed by red fruit - which is edible in some species, such as the mayhaw, but insipid on most others. There are numerous improved cultivars that are delightful flowering trees for use as a focal point in small yards. Average garden soil and water are sufficient. Stricta is a variety with a narrow, upright growth habit. 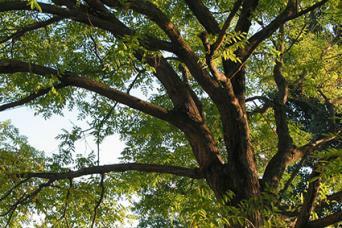 There are two trees that go by the name of locust, both of which are covered in thorns: black locust and honey locust. They are both quite large, reaching up to 100 feet in height, though the black locust stays fairly narrow, while the honey locust can grow almost as wide as it does tall. Thorns cover the branches on these trees, though they are sometimes seen on the trunk of young trees all the way down to ground level. Both trees have clusters of honey-scented white flowers in early spring, giving way to seedpods later in the year. Despite their thorns, locusts are commonly used as shade trees. They are tough and adaptable, thriving in modest soils with minimal irrigation once established. Purple Robe black locust has lilac-colored blossoms and bronze-tinged foliage. Sunburst honey locust has yellow foliage. Look to some of these thorny shrubs as potential barrier plantings, as well as plantings for their beauty and fragrance. 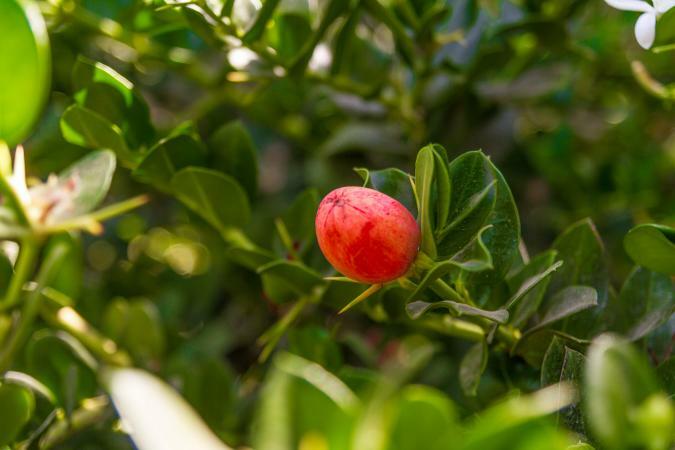 If you are looking for a hardy, drought-tolerant barrier shrub producing evergreen foliage and edible fruit, look no further than natal plum (Carissa marcocarpa). Hardy in USDA zones 9 and 10, the shrub produces 2-inch forked thorns along branches covered in glossy green foliage that exude a poisonous white sap when broken. Fragrant white, star-shaped flowers bloom year-round and give way to reddish plumlike fruits resembling a cranberry in taste. It can grow up to 20 feet tall planted in a sunny location and in well-drained soil. It works well in the landscape used as a thick, thorny screen or hedge and its high tolerance to salt spray makes it a suitable addition to seaside gardens. Prune throughout the year to keep the shrub's size maintained. 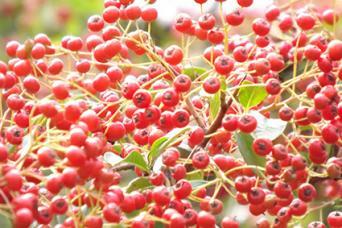 Also known as firethorn, pyracantha is not as evil as it sounds. 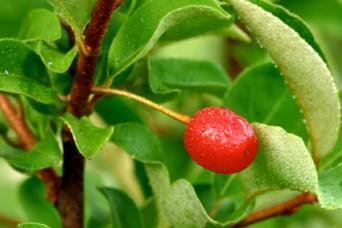 In fact, it's an ornamental shrub with evergreen foliage and bright red berries that persist through the winter. Growing from six to 12 feet in height, pyracanthas are tolerant of intense heat, drought and poor soils and are an excellent choice for making an impenetrable hedge. They are also amenable to shearing as a formal hedge, allowing them to be kept less than five feet tall - they tend to look better this way than as the sprawling leggy shrub that develops when they are left unpruned. You'll want to wear heavy leather gloves when pruning pyracantha as the thorns cover all the stems and are notoriously sharp. Silver Lining is a variegated form with silver margins on the leaves. Prostrata is a dwarf, spreading selection. Gold Rush bears yellow berries, instead of the typical red fruit. This is one of the many species of eleagnus and the only one known particularly for its thorns, which are stout, up to two inches long, and cover the larger stems of the plant. Silverthorn is an enormous evergreen shrub, reaching up to 15 feet tall and wide, though it can be maintained at almost any height with pruning. It is one of the fastest growing shrubs available and will form a head-high hedge within two years of planting. Thriving in sun or shade and dry, infertile soil, silverthorn grows profusely without any fertilizer or care, making it arguably the most adaptable hedge plant available. It sometimes grows a little too well, however, and spreads itself by seed, making it an invasive species in some areas. 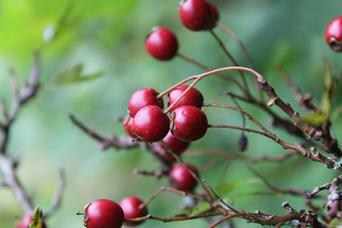 It even has fragrant (though inconspicuous) flowers and edible berries. Nana is a dwarf variety. Maculata is known for its variegated yellow leaves. Numerous succulents bear thorns, including the many species of cactus available from specialty growers. These are truly dramatic plants often used in southwestern-themed landscapes. Agaves look like something from the age of the dinosaurs with their enormous, tough, leathery leaves. On the edges of those leaves are sharp thorns, giving the impression that they are not plants to tangle with. After many years of growth, agaves send up a flower stalk that may reach 20 feet in height, putting on a final extravagant display before setting seed and dying. 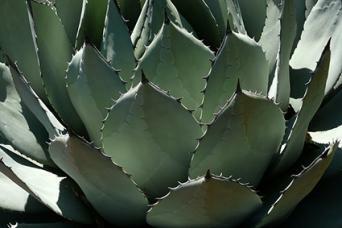 Excellent drainage is essential; plant agaves in sandy soil, if possible, and do not water or fertilize. Marginata has yellow margins on its leaves. Alba has a white stripe in the center of each leaf. By definition, cactuses have thorns, but most species cannot be easily grown in the ground outside of arid environments, such as the Southwest. Prickly pear is an exception to this rule, however, thriving in most parts of the country - places with wet summers and cold winters where most cacti don't stand a chance. Plus, they produce an edible fruit, called Indian fig or tuna in Spanish. The cactus pads, called nopales, are also edible and are a common vegetable in Mexican cuisine. 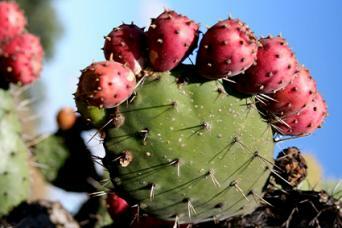 Prickly pears grow without effort by the gardener, as long as they have full sun and good drainage. Do not water or fertilize. Quillota is a spineless variety, cultivated specifically for its top quality fruit. There are relatively few vines that bear thorns, but those that do have some notable qualities. 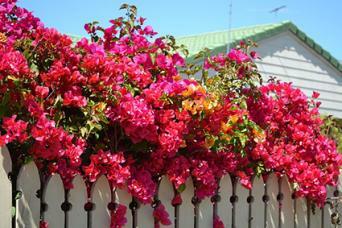 Bougainvillea is known for its colorful flower bracts, but its thorny stems make it an excellent species to consider for making a fence line more secure. It is a Mediterranean plant that requires full sun, loves hot weather and needs only modest amounts of fertilizer and irrigation. Bougainvillea needs excellent drainage, so many people choose to grow it in a pot, which also gives the option of bringing it indoors for the winter, as it is a frost-sensitive species. Plant one every eight feet along a fence for complete coverage - they will grow as tall as the support structure they are given up to a height of about 15 feet. Bagen Beauty is a common variety with rose-crimson flower bracts. Apricot Dream is a light orange variety. Blondie is covered in yellow flower bracts. Brambles refers to plants in the rubus genus, including raspberries, blackberries and their many relatives - most of which have stems covered in thorns. That doesn't stop people from enjoying the fruit, however, which is produced in mid-summer. Brambles fruit best in full sun, though partial shade is also acceptable. A good support structure is essential to keep them from sprawling across the ground. Fortunately, they are not very heavy vines, so two-inch wooden posts with wire strung between them at 12-inch intervals is generally sufficient. 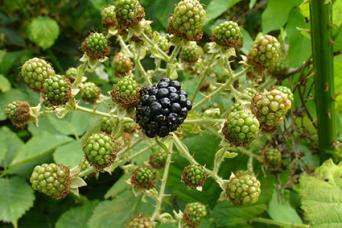 Blackberries are the largest of the bramble vines, reaching 10 feet or more if their growth is left unchecked. Raspberries are more modest growers, typically staying under six feet. 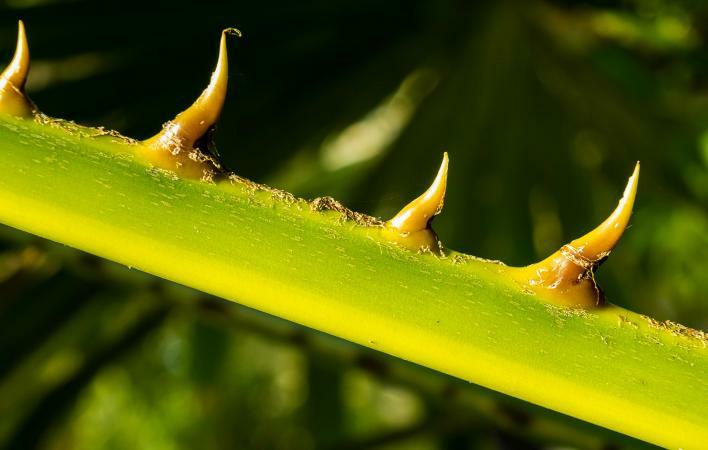 Some plants are so beautiful or bear such delicious fruit that people are happy to tolerate the inconvenience of their thorns, while others are planted specifically for the message that their thorns will send to potential intruders. Either way, thorniness provides an interesting way to categorize plants and represents a unique form of beauty in the botanical world.